I am happy to announce that you can now tag discussion threads! You can tag a post that starts a new discussion thread with relevant version/product, role, or industry tags – just like a webinar or a blog. This will allow for the content of the posts to be more easily categorized and show up in tagged searches. If you have already created and sent your post to the forum, you can add a tag next to the little tag icon. Press 'Add a tag' and you can view the list of tags to search from or start typing a term to find a tag. You can add or remove tags threads that you have started at any time. To remove a tag, simply press the 'x' button next to it. 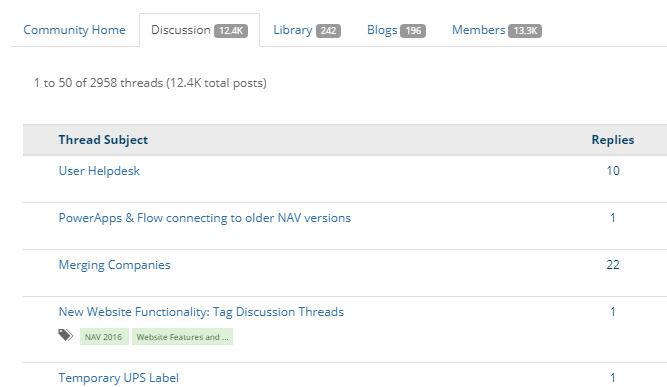 Other NAVUG users who reply on your thread cannot add or remove tags. 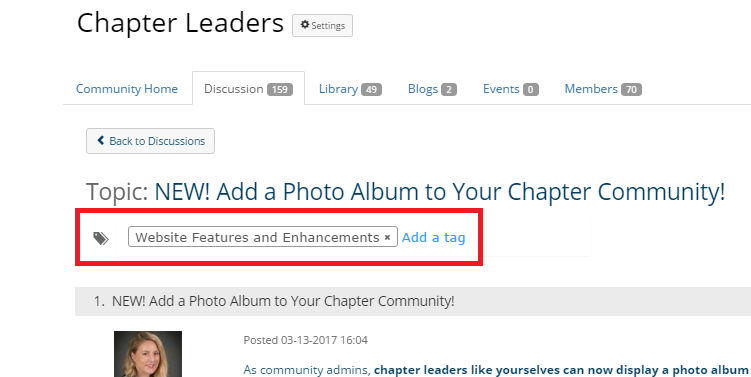 After you tag a discussion, the tag will show up in the discussion lists allowing users to quickly ascertain the content of the thread. Also when a user searches on that tag, your discussion will now show up in the results. We have matched the tags to our current ones being used on the site. We hope that you will enjoy using this new feature, and please feel free to leave feedback on this post! Tags have gotten an upgrade – into #hashtags! This new #WebsiteFeaturesandEnhancements upgrade is intended to make it easier for NAVUGgers to tag their content! 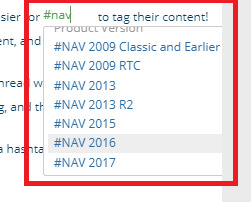 When NAVUG participants want to add a tag their post - start typing "#" and the first characters of a tag in the body of the content, and the system will suggest approved NAVUG tags* (such as #NAV2016). The user should select the hashtag they would like to use, and that will automatically tag the thread. You can also remove tags from your content by editing their post and deleting the #hashtags in their content. Upon save, the thread will no longer be will tagged. New! You can now add tags via email! NAVUG participants can now reply via email and include an approved NAVUG #hashtag, and the system will convert the #hashtag into a tag!